For nine years, I have been writing this Transitions column. My mom says people think it is specifically about us. My columns are not about Mom; they are about everybody; you, me, your parents, your kids, us. We are all sharing the experience of a life change, and we are all getting older. 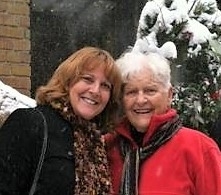 Today, I actually am writing about my mom. Let me introduce you to Gladie Reimer Long. She grew up on Tayco Street in Menasha and moved to Appleton when she and Dad were married. She raised eight children on a tight budget. Mom celebrates every day. If you meet her, she becomes your champion and wants the best for you. She has taught me to make the most of every situation. Mom is a forward thinker. She and Dad started A-1 Moving & Storage in 1960. It was Dad’s idea. Mom saw the possibilities, encouraged him to do it and together they took the leap. Mom was a full-time partner in the business. Over the years, Mom has always been one step ahead of the game. In later years, Mom and Dad built their dream home, ideal for hosting their many parties with family and friends. It was perfect for that time in their life. Two years ago, Mom moved from the house into a retirement community. Dad had Alzheimer’s and couldn’t be independent anymore. He passed away just over a year ago. That brings us to today. I interviewed Mom about the transitions she has made in the last couple of years. Mom: “I know for sure that I wouldn’t want to be anywhere else. I wouldn’t want to be alone in a house by myself, I don’t like that idea at all. Here, there is always something going on. All I do is step out my door and I have someone to talk to. Everyone is friendly. We talk and joke. I get into a good mood just by talking to them. When you come back (to the apartment), you’re alone. I wasn’t ready 4 years ago. I wasn’t ready 3 years ago, but when the time came, it was the only choice. I had taken care of Dad as long as I could. I couldn’t do it anymore. Everything fell in place. God was with me all the way. We moved here together, me here in this apartment and him just down the hall in memory care. It was perfect. I could see him whenever I wanted. Now I am here for when my situation changes. I might need assisted living or memory care, and I am here. Jean: What I can tell you readers is that none of us children have to worry about Mom, she is more independent than the last few years in the house and she is livin’! Again, you are right Mom. You made the right move. As I said, Mom celebrates each day. For her birthday, she celebrates the whole month. So, if you see her any time in February, wish Mom a Happy Birthday!